Do you have a registered nickname in Freenode IRC network? Then probably you are asking how to join with that nick via Hexchat. One of the common errors is Nickname is erroneous or already in use. This article This article provides short instructions about get rid from that kind of error. When you run Hexchat program, you will see a dialog window namely Network List with some user accounts and networks options. What you need to set here is the User Information and the IRC network. (1) Fill the four boxes of user information with your nickname and nickname aliases. For example, my IRC nickname is Malsasa, so I enter Malsasa_, and Malsasa__, as my aliases and the last is Malsasa as my username. Both nickname and username are useful to create some automatic IRC command variables (nickname = %n, username = %u). 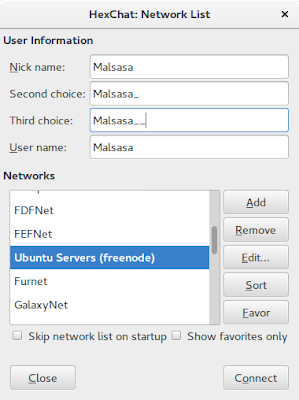 (2) Select Freenode from the Networks list. (4) Check the Use global user information option, so Hexchat will use the information you gave previously. For another options available, they are up to you. (5) Select the login method NickServ (/MSG NickServ + password). (6) Enter your freenode IRC nickname's password in the Password: field. Note: enabling Connect automatically option will connect you automatically to the selected server every time you start Hexchat. (3) Click Connect commands tab. (6) Change login method to Custom (connect commands). This command will kill the "ghost", which is your nickname, living in the Freenode server. While it is killed, Freenode will allow you to change nick into that nick. This command changes your current nickname into [username]. This command log you in with your Freenode IRC's nickname + password credentials. 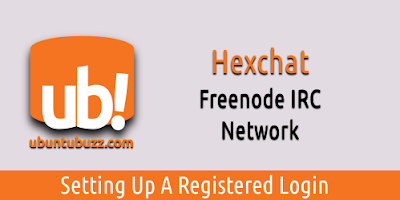 Note: you may do those commands manually --if you wish-- directly from the Hexchat text input box while you are connecting to Freenode. -NickServ- You are now identified for Malsasa. -NickServ- You are already logged in as Malsasa.